Cuba, a one-party nation, does not yet respect all children’s rights. While children do have access to the bare essentials, they must still grow up in what are often closed surroundings. In Cuba, approximately 10% of the population lives below the poverty-line. However, even poor Cubans still have access to basic services such as healthcare, education, clean water etc. Nevertheless, it is vital that one eradicate the poverty that does exist, so that all children, regardless of their social status, have access to the same rights andopportunities. 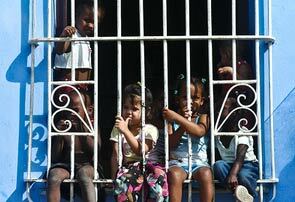 Infant mortality, although it is constantly falling, remains a major problem in Cuba. Today, approximately 6% of children die before their fifth birthday. The positive force behind the declining mortality rate is the establishment of free health care, in both urban and rural areas. The principal cause of death among children is domestic accidents. 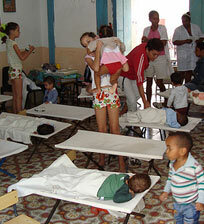 A national prevention program, coordinated by the Cuban Public Health Minister, is aimed at limiting such occurrences. Access to education is compulsory through the ninth year and Cuban law prohibits children below the age of 15 from working. Despite this, numerous children below the age of 15 are seen doing so. Some of children, in accordance with family custom, must work. In effect, the idea of sending a child to work so that he can earn some pesos for the household remains acceptable in certain families. Even so, such work can have a negative impact, be it physical or psychological, on the lives and mentality of children. As a result, the Cuban government has seen fit to implement rules and regulations outlawing the use of underage children in the workplace. 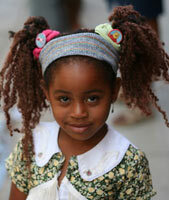 As all children attend school it is evident that the right to an education is respected in Cuba. Not only is education free, it is also mandatory. Whether they live in an urban or rural area, Cuban children have access to a quality education which has served to eradicate illiteracy. However, differences persist, notably with regard to internet access. Children resident in the cities are able to benefit from this worldwide “platform,” whereas children residing in villages are often deprived of it. Right to free speech for Cuban children appears to be limited. In Cuba, the prevailing attitude is that each citizen’s personal success and happiness is of secondary importance in comparison to the State’s well-being. This being the case, children do not have the freedom to do as they wish and express themselves in ways that run contrary to the opinion of the government. The Cuban system thus remains a barrier. It is important that the autonomy of every child be recognized so that they are able to freely enjoy their rights. With an annual emission rate of 2.6 tons of CO2 per inhabitant, Cuba does not number among the most egregious polluting countries. However, this rate is considerable high and needs to be lowered as the effect that it has on the lives of the children and future prospects maybe substantial. All children have the right to live in a healthy environment. Thus, Cuba needs to make a greater effort to reduce the negative impact it is leaving on the environment.